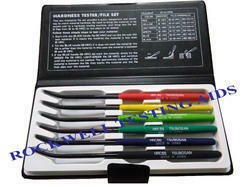 Pioneers in the industry, we offer hardness tester file set from India. Marks the material, the material is less than 65 HRC. Between 60 and 65 HRC. material and the file that slides over the material. approximately. 157” in diameter and 7” in length ( 4.30 X 175mm).